Helping YOU with YOUR next Fundraiser! Are YOU planning a fundraiser for your church youth group, Christian school, or other Church organization? Do YOU want to provide a product that won’t just add one more thing to the shelf or one hundred extra calories to the purchaser? Do YOU want to provide something that will last and last and last? Do YOU want to provide something that will help others grow in Christ and clearly present the Gospel message? Do YOU want to make a really good profit on the product YOU provide? These quality Christian books will be a welcome addition to any home, school, or church library. Each book has been read and endorsed by Christian leaders who uphold the Bible as the inerrant Word of God. You and your family can be blessed and encouraged for years to come as you read and re‐read these books. These books also make ideal books for reading clubs and reading circles. They can also be used as a basis for small groups or Bible studies. These quality Christian books are also a blessing to Christian schools and organizations who use them for fundraising projects. One third of the price of each book is returned to the school or organization to support their ministries. 1. You will need a sales brochure. A color version is provided and it printswell in black and white. A sample is available at the end of this section. You can get the brochure in either Word Publisher or Word Adobe format. The brochure includes all books currently available. It includes a brief description of each book. It includes an order form where there is a place to put your organization name and when the orders are due. Call Quality Christian Books to place a pre­order. We will not order books until the final order is sent. 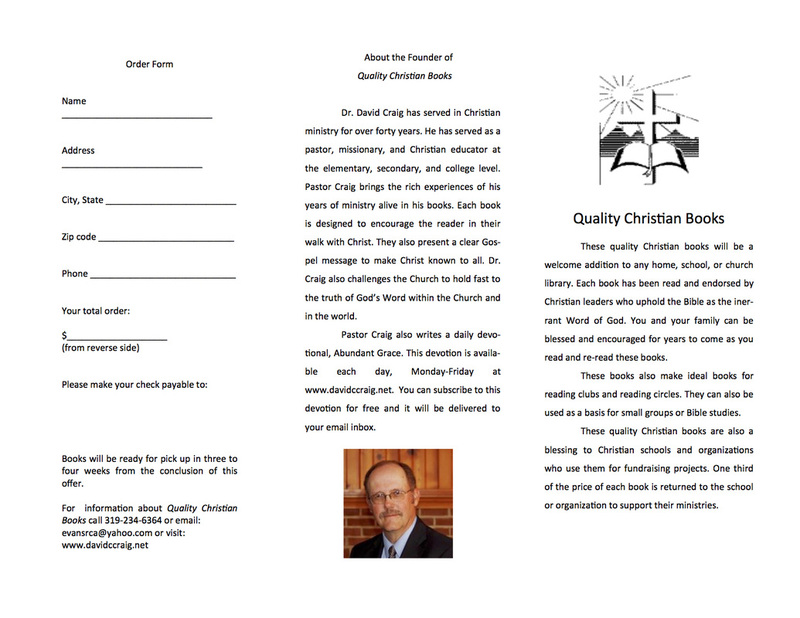 Send Quality Christian Books a check for the remaining funds. Orders will then be filled and the books will be drop shipped to your address for distribution to your customers. Shipping requires 3 – 4 weeks. Now! The most important thing to know is how to contact us. 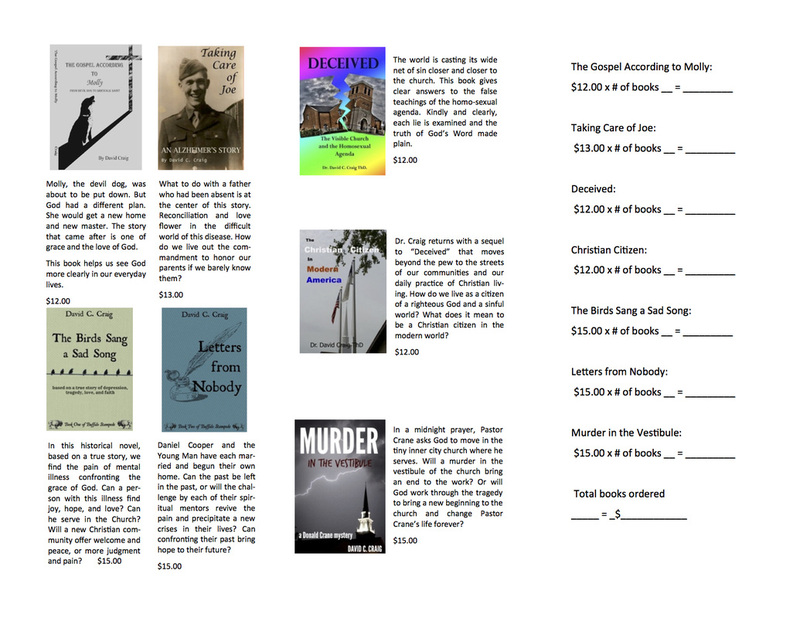 One More Thing: There is one more way to use Quality Christian Books as a fundraising tool. Dr. David Craig, author of Deceived: The Visible Church and the Homosexual Agenda conducts seminars on his book. He conducts these seminars in Wisconsin, Illinois, Missouri, Iowa, Minnesota, South Dakota and Nebraska. The charge is traveling costs, including lodging, plus 75% of book sale receipts. Whatever you wish to charge to attend the seminars plus 25% of book sales, less expenses, is entirely yours.